The global in-vitro fertilization market is developing at a high pace with the technological advancements and the introduction of advanced treatments. The high awareness rate among people and the rising spending capacity of people, especially in emerging nations to ensure the growth of the market in the near future. As per the research study by TMR, the in-vitro fertilization market is expected to exhibit a healthy 6.50% CAGR from 2017 to 2022. The global in-vitro fertilization market is expected to rise at a fast pace over the next few years. The increasing awareness among people related to the condition of infertility and the availability of several effective treatment options are estimated to encourage the development of the global market in the coming years. Governments, across the globe, are making ardent efforts in creating an awareness among people regarding IVF treatments and the advent of advanced products are estimated to enhance the development of the overall market in the near future. Also, the reducing fertility rate and the substantial rise in the number of male infertility are projected to ensure the growth of the market in the coming years. On the other hand, the in-vitro fertilization market is predicted to face several challenges, which may result in a downfall of growth in the coming years. The low success rate and the high cost of IVF treatment and the reducing efficacy of the infertility treatment with the developing age are estimated to curb the growth in the near future. Nonetheless, the rapid development of the fertility tourism is expected to ensure the development of the in-vitro fertilization market in the next few years. The global in-vitro fertilization market has been categorized in terms of geography into Latin America, Europe, North America, Asia Pacific, and the Middle East and Africa. The Asia Pacific market is projected to lead and remain in the position over the next few years. The increasing popularity of medical tourism and the increasing number of government initiatives are anticipated to support the development of this region in the next few years. The research study by TMR states that the Asia Pacific market is expected to exhibit a promising 6.80% CAGR from 2017 and 2022. Europe and North America markets for in-vitro fertilization are anticipated to experience a promising growth in the next few years. The rising investments and the technological developments in the IVF technologies are predicted to support the growth in the coming years. The in-vitro fertilization market is characterized by a high level of competition, due to the existence of a large number of players operating across the globe. The competition among the players is expected to get intense with the next few years with the growing focus of the players on the research and development activities. Also, the key player are emphasizing on the development of new products and innovations in the in-vitro fertilization, which is predicted to offer lucrative opportunities over the next few years. 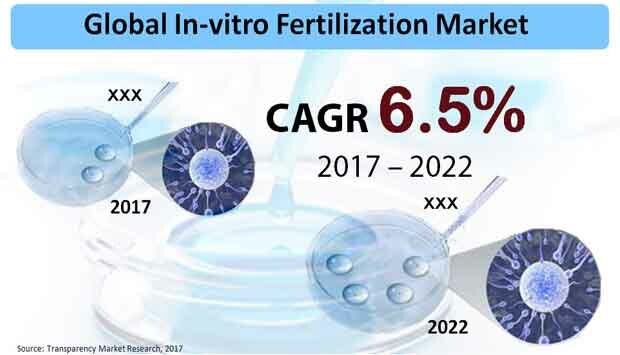 The leading players in the in-vitro fertilization market include CooperSurgical, Ovascience, Inc., Rocket Medical PLC, Vitrolife AB, Thermo Fisher Scientific, Inc, Genea Ltd., Cook Medical, Fertility Focus Ltd., Merck KGaA, and EMD Serono, Inc. The report on the global in-vitro fertilization market offers a comprehensive assessment of key factors and current and emerging trends impacting the growth of the market. It offers insights into share and size of various segments based on end use and product type in various regions. The threats of entry of new players into the market is also highlighted in the report. The evidence-based findings help in identifying lucrative growth prospects and in strategy formulation. The study also takes a closer look at regulatory landscape governing IVF treatments and the factors that will bode well for the market in the foreseeable future. The report takes into account supply chain structure and pricing analysis and assesses the profile of distributors to get a balanced view of the growth of the market trajectory. The global in-vitro fertilization market estimated valuation is US$529.8 Mn. in 2017. Witnessing profound potential opportunities in various regions, the market is projected to rise at a CAGR of 6.5% from 2017 to 2022 and reach US$725.9 Mn by the end of the forecast period. The reports offers detailed insights into notable trends, emerging opportunities, lucrative avenues, and strategic dynamics. The research offers a granular analysis of the factors that will boost the adoption rate in various regional market. The rising case of infertility in couples owing to various lifestyle factors, including environmental and occupational exposures, is boosting the demand for IVF in various developing and developed regions. A growing number of couples are delaying the family planning, thereby bolstering the demand for assistive reproductive technology such as IVF. A burgeoning medical tourism in several emerging economies, such India, Brazil, and China has fortified the demand for IVF treatments. The availability of affordable treatments along with the promise of a good outcome in these nations is a key factor contributing to the growth of the in-vitro fertilization market. On the other hand, the comparatively unsuccessful outcome with the first few IVF procedures is a key factor likely to hamper its demand among discerning couples. Nevertheless, the improvement of laboratory infrastructure in developing countries and the advent of novel technologies are key factors expected to accentuate the market. The report offers an in-depth segmentation and offers their share and size. The report meticulously tabulates statistics based on year-over-year growth of various product and end-use segments. This helps the readers to have a thorough overview of the market along the historical as well as forecast period (2017 -2022). The report segments the in-vitro fertilization market based on product type, end use, and geography. Based on product type, the report segments the market further into equipment, reagents, and others. Among these, reagents hold the major share in 2017 and is expected to maintain its dominance. The market will witness the dominant absolute growth over the period 2017 - 2022 and the segment is projected to expand at a CAGR of 6.3% during the same period. Based on end use, the report segments the market into fertility clinics, hospital and research laboratories, and Cryobanks. On the basis of region, the report segments the global market into North America, Latin America, Middle East and Africa, Europe, Asia Pacific excluding Japan (APEJ), and Japan. Of these, the APEJ in-vitro fertilization market is the most lucrative market expanding at a CAGR of 6.7% during the forecast period to reach US$ 235.9 Mn by 2022 end. The dominance of the region is driven by burgeoning demand for IVF treatments, attributed to the rising infertility in women and men in several countries. Improvements in health care is likely to further bolster the uptake in the region. The report offers extensive profiling of prominent players and the strategies adopted by them to gain a competitive edge over others. Some of the leading players operating in the global in-vitro fertilization market are Thermo Fisher Scientific, Inc., Cook Medical, Merck KGaA, Vitrolife AB, Ovascience, Inc., CooperSurgical, EMD Serono, Inc., Genea Ltd., Rocket Medical PLC, and Fertility Focus Ltd.